Kat - I was at university when I first saw the issue of the journal Nature sporting a rather surprised-looking sheep on its cover. 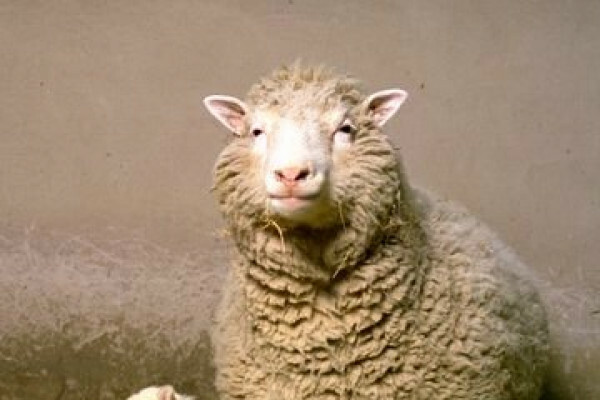 Announced to the world in February 1997, the birth of Dolly the sheep rocked the world. Her birth actually came a few months earlier, in July 1996, so to celebrate, the Roslin Institute in Edinburgh - where she was cloned and born - and the MRC Centre for Regenerative Medicine decided to throw a party, or rather a scientific symposium in her honour. I was lucky enough to be able to go along, and even more lucky to be able to speak with Sir Ian Wilmut, who led the team responsible for the creation of Dolly. I started by asking him to explain the history of the research leading up to her birth. Ian - The very earliest experiment was trying to answer a biological question as to whether essentially, all of the cells retain the same DNA during the course of development. Because there was a suggestion - a hypothesis - that development was brought about, differentiation was brought about by the loss of sequences which were not important for a particular tissue type. A series of very simple experiments were done to address that question and the answer was, there was no evidence of DNA being lost. Kat - So this is the idea that somehow cells are shedding genes as they're making decisions to become brain or muscle, what was the key experiment that showed that couldn't be the case? Ian - The nuclear transfer experiments which were done by Briggs and King and subsequently by John Gurdon demonstrated that you could take differentiated cells from tadpoles and produce adult frogs from them. So that clearly showed that those differentiated cells still had all of the information necessary to control development. Kat - But they never managed to go from an adult cell to another adult. Ian - That's a really intriguing point, but I think you can only suggest that there must be something different in the way in which gene expression is regulated and that whereas we have methods which overcome these now for early stages of development, we haven't yet got that for adult frogs. Kat - So, that was frogs and you thought, "Okay, let's try this in sheep." Why sheep? What was the background to that? Ian - We got started because I heard that Willadsen had cloned from blastocysts in cattle. What I was looking for was a way of having cells at which we could culture for a while to allow you to make precise genetic change and then use its nuclear donors. It seemed, if he was growing cells from blastocysts and the cloning from them then maybe we were reaching that point. Kat - So that's taking cells from a very, very early embryo, putting them into an egg and making another animal. So the idea was, can we do this from cells in a petri dish? Kat - Tell me first then about Megan and Morag because those were actually sheep before Dolly. Where did they come from? Ian - They came from cells which had been cultured with the hope of getting embryo stem cells by my colleague Jim McWhir. What he found was that not that the cells multiplied vigorously and differentiated but the cells that we were looking for simply ceased to be there. They just disappeared. So we did an experiment taking cells from different days of culture to try to see whether we could confirm this interpretation by having success with probably about day 9 embryos. But if we went through to day 10 and 11, then they've lost the ability to support development because they've either disappeared or changed. Kat - So Megan and Morag were sheep that were cloned from this very early embryo cells. What about Dolly? Tell me about her biological history. Ian - Well, the classic thing for developmental biologists to do when they're studying these sorts of mechanisms is to look at very early stages, foetal tissue and then adult tissue. So we always had it in mind that we would progress along that sequence of development. As you say, we'd worked with early stages, we worked with foetal cells. Because we'd been successful with those early stages, we started with adult tissue. Kat - What was the adult tissue that you used to clone Dolly? Ian - It was mammary tissue. Our collaborators, PPL Therapeutics, you remember the project to make sheep that producing their milk proteins needed to treat human disease. They were growing mammary cells in the lab as part of that project so they knew how to grow them. They knew that they had a normal karyotype and were likely to be suitable nuclear donors. Kat - So then to create Dolly, just if you can really briefly explain the process, how does it work? What is cloning? How does it work with an adult cell? Ian - You need two cells. you need an egg from which you remove the genetic information, the chromosomes, and you need a nuclear donor which will provide the nucleus that controls development. So in the case of Dolly, this was a mammary cell which was in culture which was used and proved to be able to control development. Kat - Presumably, people had tried to clone from adult cells and it hadn't worked. Why did it work with Dolly? What was special about those experiments? Ian - I don't know if anybody actually had tried adults in mammals. What happened to people I think was that they tried with very early stages and it worked but as you began to work with cells from cells partway through pregnancy it didn't work. So there was no point in going through it to adult. Kat - So just, it's not worth bothering trying. Ian - It's not going to grow, yeah. Kat - What did make the difference that seem to make it work? Ian - What we did as preliminary work was look at the best way to coordinate the cell cycle of the two different cells. we came forward with a scheme of using cells which had donor cells which had been serum starved in order to make them quiescent. Kat - This is kind of just put them to sleep basically. Ian - Yeah, exactly. And also oocytes which were in metaphase 2 because we knew that they had a great potential to stimulate to transfer nucleus to enter into the cell cycle in such a way that it might well also be able to reprogram this expression of genes in the nucleus at the same time. Kat - So you've got the donor cell that's quiet, it's all asleep, it's not doing anything, and you've got an egg cell that's really ready to go for it. That's the key. Ian - That's exactly it. Kat - When Dolly was born, how did you feel? That must have been incredible. Ian - Yeah. I think we were almost shocked because it was such a novel thing. We knew how important it was going to be, both immediately from the point of view of the media and from a career point of view from the point of view of building a reputation for the group. Kat - This may seem like a bit of a silly question but what was she like? Ian - The best way to describe this, I live down in the borders, in amongst sheep farmers. If they have a lamb which is not being mothered either because its mother has died or she's got too many lambs, they take it into the house. It becomes accustomed to people and that's exactly what happened to Dolly. There were so many people visiting and wanted to see her, to get her to be in photographs and this sort of thing that she became accustomed to people. She came forward to people where there's no - as it were, no ordinary farm sheep would do that. It would automatically turn and run. Kat - What happens to the rest of her life? I understand she ended up having her own lambs. They weren't cloned, were they? Ian - She had six lambs by normal reproduction. I'm pleased to say were all healthy. One of the rules of thumb for cloning is that if an animal has an abnormality but can breed then its offspring will not inherit the abnormality because it's likely to be an inappropriate expression of a gene rather than the loss of a gene. And the reprograming will restore their function to normal. Kat - So she became a mum and then what happened to her? How long did she live for? Kat - That's quite short for a sheep. Ian - But we euthanized her because sadly, there is a virally induced cancer which occurs in sheep particularly in Scotland as it happens. The infection got into the flock and unfortunately, there is no treatment for it. So after she'd had it for a number of months, we decided it was time to euthanize her because what happens is the tumour got so large that it restricts the animal's ability to breathe then only kind to end their life. Kat - Absolutely and where is she now? Ian - Now, she's I think one of the most frequently visited exhibits in any British museum. She's in the National Museum of Scotland. Kat - You are the father of Dolly I suppose, scientifically speaking at least. What do you feel has been her key scientific legacy and your key scientific legacy? Ian - She made biologists think differently because we showed that cells can be changed. Many members of your society will know that Shinya Yamanaka who was awarded the Nobel Prize because of the work that he did to take advantage of this new knowledge to develop ways of changing cells and reprograming cells. He says himself that he was stimulated to start the project because of the birth of Dolly. And his work then led to the development of methods to produce iPS cells. So I may be the father of Dolly but I think I'm the grandfather of iPS cells. Kat - Ian Wilmut there. And in case you're wondering, Dolly was indeed named after the country singer dolly Parton, due to her origins from a mammary or breast cell.